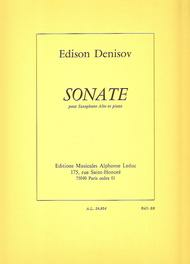 Composed by Edison Denisov (1929-1996). Leduc. Classical. Softcover. 48 pages. Alphonse Leduc #AL24654. Published by Alphonse Leduc (HL.48182907). 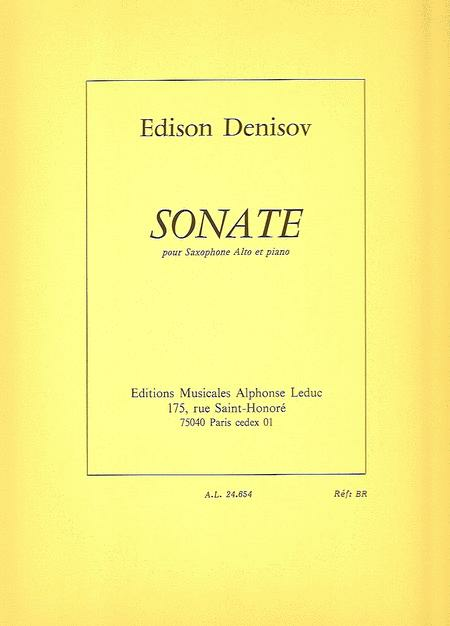 “Sonata for Alto Saxophone and Piano by Edison Demisov was composed in1970 and covers three movements. The first part, Allegro, shows serialism; the second, Lento, focuses on new techniques; with the last one, Allegro Moderato, reminiscent of Jazz music. This strong>Sonata for Alto Saxophone and Piano, dedicated to the French Saxophonist Jean-Marie Londeix, was strongly influenced by Western European music and requires a certain level of ability (intermediate to advanced players), especially for the second movement. Edison Demisov (1929-1996) was a Russian, Siberian-born, composer specialising in alternative / non-conformist Soviet music. Strongly influenced by the West, he was often criticised by his peers. He gained international recognition for the composition 'Le soleil des Incas' (1964) and wrote numerous concerti, sonatas and other pieces.”.